You are approaching to the slot machine, thinking about if it's good day or not very fortunate period to spin a button which attracts you a lot. You are obsessed with the thoughts of your luck that can smile you while you will be playing the slots game and really hesitate, remembering all the misconceptions and myths about slot games. It's so naive! Stop flying in the clouds and let the information below open your eyes to the real slot truth! So, begin! Where is a forgery in the slots game? Its' right in the mechanism of these games. Behind the colorful and hilarious symbols and tempting winning combinations you will find its heart, or brain, whatever function it will seize, it's called Random Number Generator. And it works exactly like it's named - it generates randomly the numbers which are responsible for every symbol that you can see on the reels of slot machine games. So, you see some symbol of strawberry or the icon of Elvis and you are really glad that exactly this symbol has shown and you are so lucky. Blow away such nonsense! Instead of these symbols there are just simple numbers from 16 up to 512, and they are controlled in the random form every millisecond. So, even when you don't play it still works and spins its numbers which are responsible for every symbol. Are you disillusioned? For sure you are. You see that your obsession about destiny and all these lucky things just don't play any role in the slots games. There is still one thing that you can do and can have the impact on the winning payouts. You can somehow guess the right time where to push the button, because it really depends on the period you start playing: one second even can decide the outcome and present different results. This chip, RNG first of all must be of the good quality, because there is implemented sequence of numbers toward which it must obey. Otherwise, the gambler has a possibility to predict the game and its results. Imagine how it could be easy. 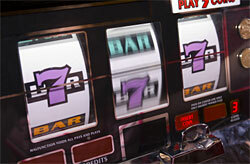 But no, there are no short cuts in reaching the jackpot in slots game. So, just the realized idea of the slot games we owe to the great mechanic Charles Fey, but what about such a huge development of it? Who is that genius who has taken away our hopes, that a destiny is a reason of everything? His name is Ronald Dale Harris, the owner of the RNG program that with these equations confuses everything. Even if the player knows how it was designed and programmed still he can't guess with his predictions the final result of the game, where it will stop on slots reels and which symbol combination it will show. So, don't waste your time on solving these questions, just enjoy playing relying on the time correlation that is very important in slots game.